This article will guide you through the process of removing a remote, sometimes referred to as a room, from your account. 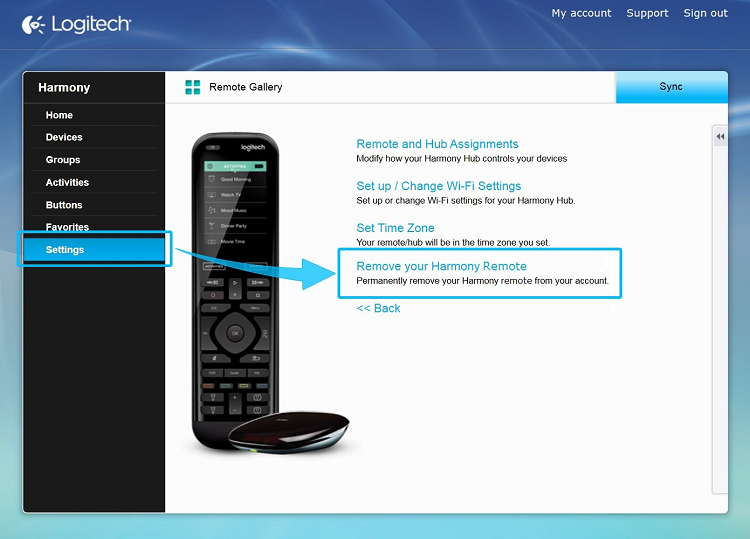 If you've upgraded to a new Harmony remote and would like to retain your previous setup, see: How to copy a previous remote configuration to a new remote. From the Remote Gallery, click the remote you'd like to remove. To the right of your remote image, if you see More >> as the last option, then click it, otherwise skip to the next step. Select the last option to Remove your Harmony remote. You'll receive a warning prompt letting you know this change is permanent, asking if you'd like to proceed. Select Yes. Since additonal remotes are typically used in separate rooms, Harmony categorizes your remotes as "rooms". You may delete a remote/room by following the steps below. Tap Room Settings, followed by Delete this room.